After the body and mechanical work, the interior is the biggest job in any restoration. Many guys who might tackle body and engine work balk at the thought of messing with upholstery. Yet, with a little information and the right suppliers you might find it easier than you think to restore your interior. Assuming that you are doing a complete replacement/restoration of the interior you need to figure out where to start. Begin by assessing each item and determining whether it needs to be replaced or restored. If it needs to be replaced you need to find a source for the parts. If it needs to be restored or refinished you need to find a qualified professional or determine if you can do it yourself. A lot will depend on the type of car you're restoring. Parts are a lot easier to find for a '69 Chevelle than they are for a '60 Alfa Giulietta. On the other hand the Alfa is a much smaller car with fewer parts so you might be able to do more of the work yourself. Even more common, later model cars can be difficult to source parts for if they aren't collectible models. The '69 Chevelle is easy, a '69 Skylark may be more difficult. Let's go through the interior item by item and consider what the common problems and solutions are for each. 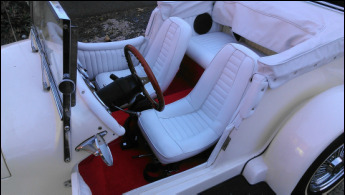 The cloth, leather or vinyl covering on your seats is often the biggest expense of an interior restoration. Even if the foam and framework of your seats are in good shape just replacing the leather covers can cost thousands, depending on the car. So you need to decide - do I need/want to replace all the material? Maybe just the driver's seat is worn and everything else is good. In the case of leather or vinyl it may be possible to re-dye the seats or do some combination of replacement and redyeing. Some parts may be candidates for vinyl repair. For some cars ready-made kits containing everything in the car are available at reasonable prices. If you can use tools and read directions this may be the way to go. Before you decide read the sections on this site about restoring leather and installing new upholstery. Otherwise, contact us to do the job for you. In older cars the carpet is almost always wasted. Even with little use they get faded and smelly. More often than not they're ruined. The good news is that carpeting is one of the easiest things to replace in most cars. Carpeting comes two ways - molded or cut and sewn. Cut and sewn carpets are found in older cars before 1970. Around that time molded carpets began to appear and now almost all production cars have molded carpets. Carpet manufacturers will sometimes offer molded carpet to replace cut and sewn and vice versa,so it's up to you what you want. Molded carpet is easier to install but for some people authenticity is more important or they may choose cut and sewn for a custom look. If a cut and sewn carpet is not available for your project a good auto upholstery shop can make up a set - at a price. Check out the article on replacing carpets to see if it's something you want to try yourself. Or let us help you. The roof lining can be a real stumbling block for the do-it-yourself crowd. Some are suspended, some are molded shells covered with fabric and some are glued right to the roof. Modern cars - after 1975 or so - are almost exclusively molded and these are the easiest to replace or recover. Suspended liners appear on older cars and require a fair amount of skill to replace. Some require the front and rear glass to be removed. In most cases, unless you have a great deal of time and patience, I would leave this to the pros. Some older foreign cars, such as Jaguar, have the fabric glued directly to the roof of the car. Removal is easy but involves a lot of glue removal. Replacement is tricky, requiring the right kind of glue and once again, is best left to a professional. Not surprisingly, dashboards are often in very bad shape on older cars. Over time, constant exposure to the sun and temperature extremes dries out the plastic and causes it to crack and warp. In extreme cases the foam padding is damaged as well. Dash repair is possible but the potential for an effective long term repair decreases rapidly with the severity of the damage. On some high end cars the dash is wrapped in leather. Sometimes leather can be refinished. If the leather is basically intact but is dry and faded it may be possible to restore it by treating it with oil, repairing small cracks and nicks and then recoloring. This is covered in our section on leather restoration. Wrap: The leather can be replaced. This involves removing the old leather and any padding then re-padding and wrapping it with new leather. Depending on the design of the dash this can be easy or quite challenging, as in the case of tight curves. In most cases it would best be done by a professional. Overlays: Molded dash skins are available that you can glue right over the old dash. They are available for many makes and models and while they may not be desirable for a concours type restoration, in most cases they do an excellent job for not much money. These are ideal for the do-it-yourselfer. Simply prep the dash according to the directions and glue on using the supplied cement. These covers come in black or a number of colors that are not matched to original. They are paintable and original matching interior paints are available from a number of sources. One company in particular offers a variety of different grains to match original. Reproduction: For cars popular with restorers such as Mustangs and Chevelles, reproduction dashes are available. Quality varies so do your research. The best and most expensive way to go is by sending your dash to a company such as Just Dashes that actually vacuum forms a new skin over your old dash frame. Accurate grain and color is matched in most cases and you essentially have a new dash. If originality isn't a factor you may choose to strip the original plastic off and custom wrap the dash with leather, vinyl or the fabric of your choice. You may be able to do this yourself. If not, check with an upholstery shop. Of course for some models factory original dashes and dash pads may be available from the auto manufacturer. The cost tends to be prohibitive but depending on your wallet and the project this may be the way to go. Door panels vary greatly from car to car. Some are as simple as a flat board with a few cutouts covered in vinyl or fabric. Others, especially on modern cars, are complex molded marvels of engineering made in 2 or 3 parts with inserts and pockets and switch panels. Restoration on these is usually limited to repairing torn vinyl and perhaps recoloring some areas. This is well worth doing since new panels can cost hundreds of dollars. Fortunately, for most models popular with restorers, there are reproduction panels available complete with correctly embossed vinyl, chrome trim and original colors. In some cases though, where the panels are simply flat boards and/or replacements are not available, you can make your own out of panel board using the old panel as a pattern and covering it with the fabric of your choice. This is the only way to go if you are doing a custom job where originality isn't even an issue. The later the model, the more plastic will be found in the car, frequently faded, scratched or worse. There are ways to refinish plastic but it requires some knowledge of the different plastics and their physical properties. An experienced vinyl repair technician should know how to work with these materials and would be your best option. Contact us to learn more. In the event the piece just needs to be recolored specially formulated paints that will adhere to these plastics are available in original colors. The rear package shelf that runs between your back seat and the rear window is often in bad shape due to fading, scratches, and hacked speaker installations. If a replacement is needed that is the best way to go as the cost is usually reasonable. If all it needs is a fresh coat of paint any interior paint will work. Just sand, clean and spray. Fabric covered shelves can be recovered with matching fabric, if available. If not, you can usually find something close enough. In the case where there is no replacement available new ones can often be made out of panel board.